Digital technologies involve, accompany and provoke changes in the structuring of industrial sectors. How are they more particularly transforming the creation, production, distribution processes in cultural and creative industries? What are reconfigurations and challenges associated with the rise in power of actors from the industries of communication and information? What are the new stakeholder strategies, economic models and power relationships involved? Does digital have the effect of empowering the smallest actors / self-employed / freelancers or on the contrary does it allow large players to relieve themselves of the promotion, production costs on individual creator? A growing interest in fields such as digital humanities, new media, digital cultures and the Galleries, Libraries, Archives and Museums (GLAM) sector is another important development here. The rise of a number of digital initiatives in arts and humanities practice, research and teaching has also brought up significantly the question of new skills or expertise required in these fields. The need for digital literacy and ‘re-skilling’ to adapt to new forms of arts and humanities practice in a digital environment has often come with much criticism, as it is viewed as an effort towards vocationalisation and professionalization of these disciplines, a result of the changing mandates of the university and higher education in general. How do we then productively engage with these questions of skill, expertise and labour that goes into the building of new digital industries, which are often located within and at the periphery of academia and creative practices? Importantly, how can concerns about a perceived conflict of creativity and industry be addressed as these transformations take place rapidly with the advent of the digital is an important point of focus. A critical exploration of the prevalent discourse around creative industries would offer ways of identifying what could be the different forms of digital creative and cultural industries developing in India, and how they problematize for us questions of cultural expression, knowledge production, creativity and labour. The conflation and overlap of both ‘cultural’ and ‘creative industries’ and the location of these terms within a larger discourse around policy, economic development, livelihoods and rights, takes on different dimensions post the digital turn. In the context of initiatives like Digital India, and efforts to consolidate an IPR regime, the implications of policy reforms for creative work, especially that performed within informal/underground economies and in the cultural heritage sector are many. These discussions would inform and draw from the ongoing efforts in fostering of a digital economy in India, and the many ways in which it determines cultural production in the rest of the world. 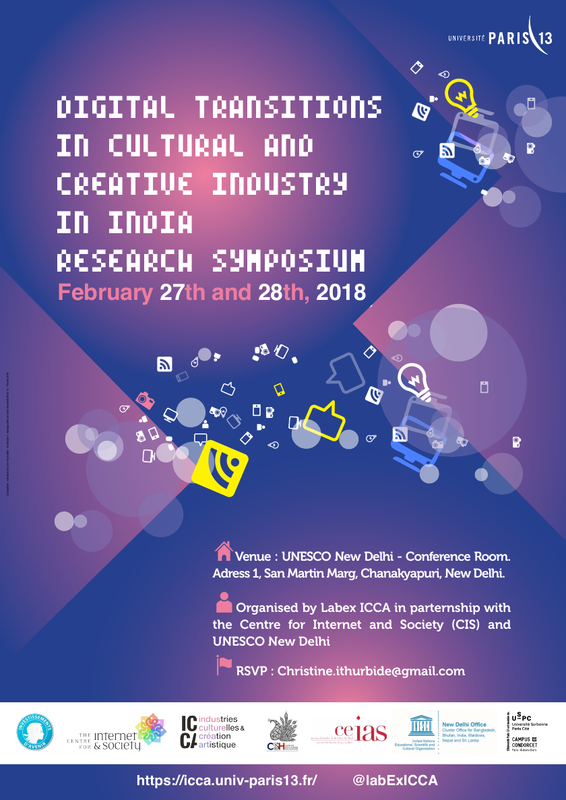 Presented by the Labex ICCA and the Center for Internet and Society (CIS), the symposium will gather Indian, French, and international specialists in the cultural industries, new media and technology, information and communication sciences, and social sciences but also professionals and industrial actors in the cultural and artistic sectors. The event is driven an ambition to promote the creation of an interdisciplinary and inter-institutional Franco-Indian research network to initiate, develop and share research on cultural industries in India and more widely in South Asia.